That’s right folks this girl is now on twitter! Huge thank you to Natalie for the encouragement to sign up! You can follow me at @kelseyruns13 Yay for twitter! I promise not to overwhelm you with tweets though! Dinner tonight was g-o-o-d! I’m the worlds biggest seafood fan and I love salmon! Can you guess what was the star of my dinner tonight? Yep, salmon! I baked a single salmon filet seasoned in with salt, pepper and some Mrs. Dash table blend in the oven. I also roasted some broccoli that I tossed in some olive oil, sea salt and garlic powder. To bring the whole dish together I microwaved a bag of Trader Joe’s brown rice and used half the bag to round out my salmon bowl. Everything combined doesn’t look so appealing to the eyes but I promise you it was delicious! I’m pretty sure I could eat some variation of this bowl on the daily. 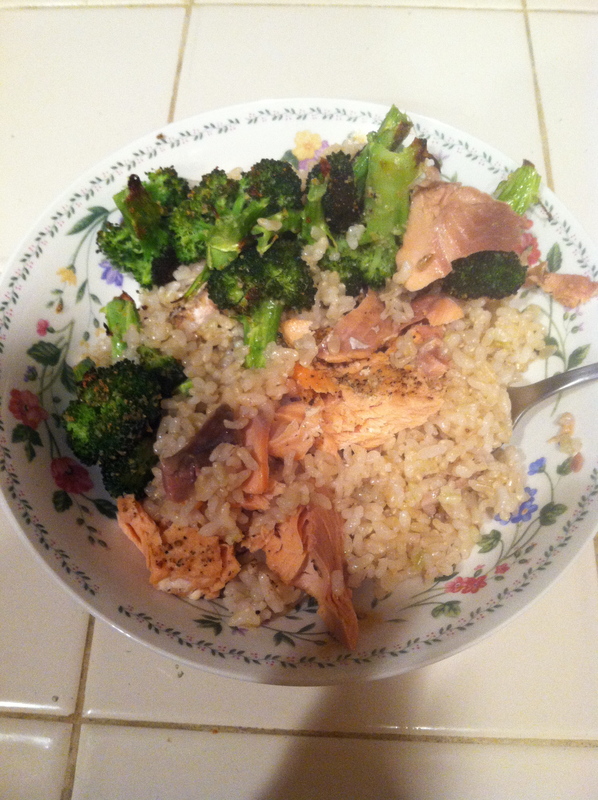 I’ll either switch out my broccoli for another veggie or trade the salmon for a different fish and I’d seriously never know I was eating this meal for every meal! Oh! 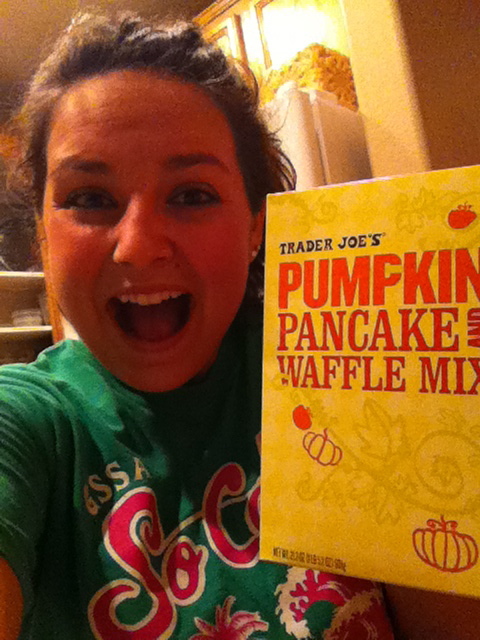 and speaking of Trader Joe’s…okay I spoke of it awhile ago but tonight I did my grocery shop and I happened upon this… Pumpkin pancake mix! Sure it might still be 90 degrees out but I’ll be getting into the fall spirit with these cakes this weekend! Pumpkin anything always reminds me of fall. I seriously think the day Starbucks brings back pumpkin spice each year (which is always the day after labor day in case you were wondering) should be some sort of holiday! I’ll definitely be incorporating pumpkin into more of my food items this fall and I’ll be sure to post some delicious recipes! Now for the workout! Bet you thought I didn’t go tonight, huh? Well I did. 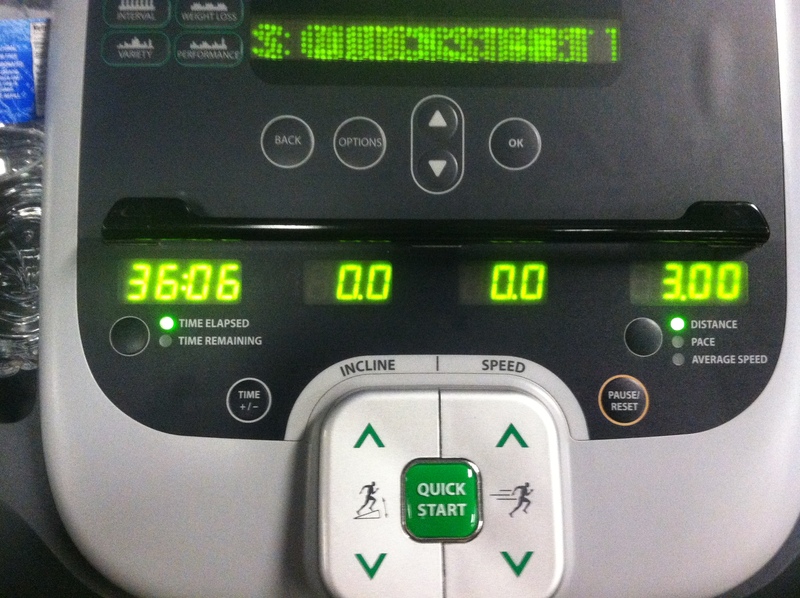 3 miles tonight! I am having a serious problem with the pain in my calves and tonight’s run was challenging. Truth be told, I felt good during the run. I wasn’t tired or dying to stop but the pain in my calves kept me from going at my full potential. I’ve ambushed just about every employee at 24 hour fitness in hopes that one of them might be able to help me with my problem and they all seem to have the same answers: Foam Roll and Stretch! Tonight however the front desk guy said I might want to look into sports physical therapy, and if the pain doesn’t get better I just might do that! And I’ll leave you with mah stats from tonight…. darn calf pain slowin me down! See ya in the morn!